This site has been designed to provide a source of technical information on the Lascar Electronics MDM-1 multifunction Display Module, and its associated development board. The design criteria for this site was to have a mailing list, downloadable files in zip format and no monthly costs so apologies for any adverts and pop-ups. 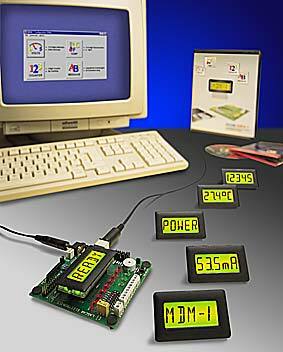 The MDM-1 allows the user to create there own instrument and display solution rapidly. The module's core components comprise of an LCD and a PIC microcontroller. The display features a backlit 5-digit 14 segment starburst LCD. The 16F877 PIC microcontroller runs at 4 Mhz and features 8k x 14-bit words of Flash program memory, 368 bytes of RAM, 256 bytes of EEPROM , a 8 channel 10-bit A/D converter, a I2C interface, a SPI interface, 8 and 16-bit timers plus I/O ports. An optional upgrade is to have either an RS232 or 2 wire RS485 interface added onboard. The MDM-1 can be programmed in many languages with the appropriate software development environment. On this site you will find a selection of applications that demonstrate the capabilities of the product. The MDM-1 development board provides a hardware interface that allows for design of the final product. The completed design will have its own custom interface to suit the application. It has provision to fit a I2C EEPROM, RS232 converter, temperature sensor, peak voltage detector, reference, LED's, switches 4 x 4 keyboard interface and a HD44780 & Graphics LCD interface. Added additional getting started info links for PIC. Added a code example for driving the DMX 973B in assembler. Added SP 5-GFX1 driver chip errata from Lars Thornqvist. Updated the Getting Going with Lascar DMX displays document. Added section on using the SPI hardware to control a SP5-GFX1. Any comment, queries, additions or uploads then please contact me at the address below.